Smith-Midland Corporation is a Virginia-based manufacturer of precast concrete components for the construction and architectural industries. Smith-Midland provides a broad array of products including building exteriors and panels, highway safety barriers and sound barriers, precast buildings and more. Smith-Midland trades at 78% of book value and has recently been targeted by activist investors. The precast concrete product market is heavily cyclical and tracks with construction activity, both private and governmental. Revenues are dependent on the construction of new buildings and roadways, as well as investment in repairs and upgrades to existing infrastructure. The market for these products would be completely commoditized but for the fact that concrete products are extremely heavy and bulky. The high cost of transport limits competition to a local level. Smith-Midland’s largest-selling products are its wall panels, which made up 22% of revenues in 2012. Barrier sales, including the company’s patented J-J Hooks® highway safety barriers, accounted for 13% of revenues. Easi-Set Precast Buildings, also with a patented design feature, were another 13% of revenues. The remaining revenue consisted of royalties on product lines licensed to other companies, barrier rentals, miscellaneous product sales and transportation and installation revenue. Smith-Midland’s results have been volatile. Revenues and profits peaked in 2010, only to plunge precipitously in 2011. Gross margin fell by nearly 40% as several profitable contracts were completed and could not be replaced. Results rebounded in 2012. Despite challenging economic conditions, the 2008 to 2012 period resulted in three of Smith-Midland’s five highest-selling years. 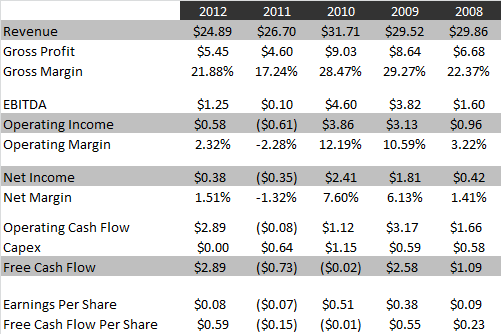 For the period, Smith-Midland averaged earnings of $0.20 per share and free cash flow of $0.23 per share. 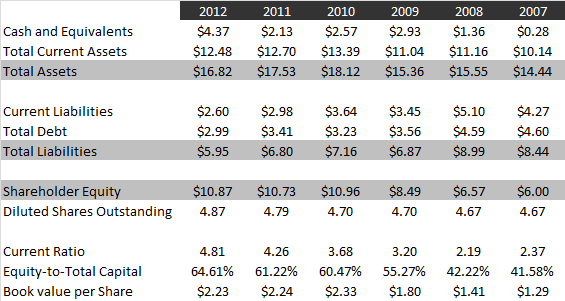 Book value per share grew by 12.1% annually from 2007 to 2012, adjusted for a 5 cent special dividend in 2012. Smith-Midland’s balance sheet is very strong, with a current ratio of 4.81 at year’s end and more cash than debt. While 2012 was a tough year for Smith-Midland’s bottom line, there is evidence that the cycle is turning in Smith-Midland’s favor. First quarter 2013 results were significantly improved over 2012, and management included very positive language on market conditions in its 2012 annual report. Revenues leaped 15% for the quarter ended March 31, 2013, and gross margin increased by a whopping 938 basis points based a 27% increase in wall panel sales and a 29% increase in royalties, rental and transport/installation revenues. Operating leverage resulted in a huge swing in operating income and a nearly 9 cent per share increase in net income. The outlook for the rest of 2013 is rosy as well, according to management’s comments in the 2012 annual report. Also, in an 8-k filing dated May 17, management indicated it was exploring the possibility of buying back shares. Buying back shares below book value is typically an excellent use of capital when debt levels are already low and expansion opportunities are limited. Smith-Midland’s intangible assets are minimal, making a repurchase even more likely to create value. At the end of the first quarter of 2013, Smith-Midland’s book value per share was $2.28. A solid year in which the company earns 30 cents or so per share could push book value per share over $2.50 or higher. At some point, the company’s discount to book value will become too wide for the market to ignore, and I would expect Smith-Midland to head higher. On the other hand, Smith-Midland’s share price could follow the path of so many other unlisted stocks and languish despite solid performance. I consider that unlikely, given the recent attention given Smith-Midland by multiple activist investors. Two hedge funds have bought up 16.2% of Smith-Midland’s shares outstanding and have succeeded in bringing about positive changes, including the payment of a special dividend and leading management to allow a shareholder rights plan to expire. (Shareholder rights plans span a variety of strategies that purport to protect shareholders from abusive takeover offers, but usually serve only to entrench management and discourage acquisition bids.) With the shareholder rights plan out of the way, the company is more likely to be acquired by a competitor or financial bidder. These hedge funds, Henry Partners and JCP Investment Partnership, will certainly keep a close watch on management’s activities. On the topic of management, management compensation takes a large bite out of operating income. CEO and board chairman Rodney Smith co-founded the company’s predecessor in 1960 and holds 15.8% of shares outstanding. Mr. Smith’s son, Ashley Smith, serves as president and holds 3.4% of shares. In 2012, the father and son team took home $325,225 in compensation. In 2011, they earned $639,477. Rodney Smith also receives $99,000 annually for use of his patents and $24,000 rent on land he leases to the company. If not for these payments to the Rodneys, Smith-Midland’s 2012 operating income would have been 78% higher. Despite high management compensation, Smith-Midland could be ready to rise. Recent results are trending much higher than 2012 and the company is projecting further contract wins. Smith-Midland’s already high cash balances could increase further, and JCP Investments and Henry Partners will be watching to make sure management uses it well. I hold shares of Smith-Midland in an account I manage. Do you have an estimate of historical ROIC similar to your analysis of SHFK? That’s worth calculating. I’ll follow up. SMID’s ten-year average after-tax ROIC is 6.76%. The five-year average is 9.95%. I calculated invested capital as Total Debt + Shareholders’ Equity – Excess Cash. I calculated excess cash as cash balances in excess of 5% of trailing sales, not exceeding an amount that would reduce the current ratio below 2.0. Currently, invested capital is $11.49 million, with excess cash of $2.62 million. An after-tax return on invested capital (NOPAT) at 9.95% would be $1.14 million, or pre-tax operating income of $1.76 million assuming 35% taxes. SMID has debt of $2.95 million. At a 6% normalized interest rate, the interest expense would be $0.47 million for pre-tax earnings of $1.29 million. Again assuming taxes of 35%, normalized net income would be $0.84 million. With a market cap of $6.10 million net of excess cash, SMID seems to be trading at 7.26x normalized earnings. Not a screaming bargain, but cheap given the strong balance sheet. As DTEJD1997 pointed out, the company’s ROIC could benefit from licensing agreements and governmental product approvals going forward. The only 2 things I would have done differently is emphasize how much earnings potential there is. In 2009 & 2010 the company was able to earn $.38/share & $.51/share. So there is potential in the future to earn substantial return on the equity. If SMID can earn $.40/share for two years running, I think the stock could trade for $3-$4/share. I think they could also turn the “special” dividend into a regular dividend. The balance sheet is solid. If things get better, they could afford to pay out most of the increase in earnings. The other point I would emphasize is that they are slowly making some progress in licensing certain products. Who would have thought you could do this pre-cast cement products? If this takes off in the future, that will be a VERY high quality stream of earnings. I would imagine the margin on it would be 80%-90%. Finally, SMID can sometimes be volatile. The time to get it is when Mr. Market panics and puts it on sale. Thanks for the great analysis & writing on this diamond in the rough. Good points! Yes, the company has a lot of potential if it can execute well. I wish I had time to give all these companies the full write-up they deserve. So another interesting point on the balance sheet… land is carried at $553K, but the company owns a total of 29 acres in Virginia. We are given an $8K / acre / year rental rate (from an officer, let’s assume it’s arm’s length), so we can impute land value very roughly by assuming a cap. rate. For example, at a 10% cap rate the land is worth $2.3M. A quick look at local comps for industrial land suggests that 10% cap rate is pretty conservative… 6-8% seems more appropriate for right now. In any case, at $19K per acre, on the balance sheet, the land seems to be valued as unimproved (vs. industrial), which seems conservative given the fact that there are manufacturing facilities currently operational. A very good point that you bring up. If the land is worth $1.5MM more than what it is carried for on the balance sheet, this is pretty significant. The market cap of this TODAY, at $1.80/share is $8.7mm, so that possibly could equal 20% of the market cap today. I also went back and looked at the 5 year trading chart. During the panic of 08/09, SMID briefly traded below $.50/share, and this year it has traded as low as $1.07 share. So, like most nan0-caps, this stock has been given away at various points. The longer I invest, the more I realize that they really big money and returns are to be made when “Mr. Market” panics and acts foolishly. There are so many examples of relatively good stocks that are just given away when the market panics OR when a company goes through temporary tough times. So the trick is to build a database of these companies, to know what they are and be familiar with the operations/financial metrics of the companies. Check in on the every few days, and when things get out of whack, be able to move in. Having some strong liquidity and being able to act quickly is the other key component. OTC Adventures is one of the very best sites when it comes to these nano-caps, every idea is well thought out and well researched. It is a GREAT way to get started on your own internal database of companies to follow. It is a tremendous resource for us value investors!